Lactose monohydrate, starch, talcum, calcium or magnesium stearate, povidone. Pharmacodynamics: Cinnarezine mechanism of action is related to Calcium channel blocker, which holds up availability and storage of Calcium ion in blood-vessel smooth muscles cells. It causes blood-vessels widening, improves brain, coronary and peripheral blood circulation. At the same time, Cinnarezine reduces neurotransmitter: noradrenaline, vasopressin and serotonin vasoconstriction action, improves blood rheological characteristic, increases erythrocyte membrane elasticity, that promotes reduction of blood viscosity and microcirculation improve. Cinnarezine facilitates vestibular apparatus centers excitability decrease, doesn’t affect on cardiac muscle compression frequency and arterial pressure. Links to antihistamine receptors, therefore reveals insignificant antihistamine effect. Pharmacokinetics: After peroral intake the preparation is quickly and well absorbed from the gastrointestinal tract. Cmax is reached in 1-3 hours. Semiejection period makes up 4 hours, 80% relates to proteins, intensively metabolizes mainly in N- dialkylation way, 1/3 metabolite is excreted by kidneys, 2/3 – by intestines. · Kynesis (road disease) prevention and treatment. Contraindications: Hypersensitivity toward compound components or acting substances; pregnancy and lactation period. Order of intake and dosage: Is taken peroraly at time of eating or after eating. Dosage regime is established by the doctor individually. Maximal around-the-clock dose for adults makes up 225mg. (9 pills). At time of blood circulation disturbance in brain: In adults and children over the 12 years: is prescribed 25mg. (1 pill) 3 time in a day. Children 8-12 age: is prescribed half dose of adults 3 times in a day. Children 5-7 age: is prescribed quarter dose of adults 3 times in a day. 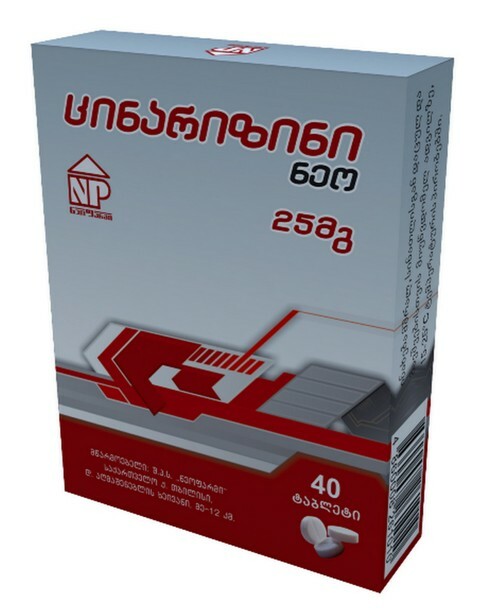 At time of peripheral blood circulation disorder: For adults is prescribed 50-75mg. (2-3 pills) 3 times in a day. At time of vestibular disturbances, Meniere’s syndrome, Kynesis (road disease): In adults and children over the 12 years: 1 pill - half hour before the trip and 1 pill during travel in each 6 hours. Children 8-12 age: half dose of adults’ is recommended half hour before trip. Children 5-7 age: quarter dose of adults’ is recommended half hour before trip. Recommended overdose is forbidden. Intake of “Cinnarezine Neo” is necessary during several months, in order to reach the best therapeutic effect. Treatment should be started by the low dose (half of the recommended dose), and then daily dose should be increased gradually until the desired therapeutic effect. Side effects: Rarely may develop the following side effects: sleepiness, feeling of fatigue, weakness, headache, dry mouth, dyspepsia events, allergic reactions, sweating. Great dose intake for a long time in elderly may reveal extrapyramidal disorder symptoms (tremor, balance disorder) which require preparation remove. Drivers and patients whose activity needs attention concentration and quick psychomotor reaction. At time of long use, it is recommended to check liver and kidney function, also blood. Pregnancy and lactation: Usage of preparation at time of pregnancy and lactation isn’t recommended, as there isn’t clinical research data concerning its safety. Interaction with other medicines or other sort interaction: Simultaneous reception of Cinnarezine and alcohol, tricyclic antidepressants, central nervous system suppressing action preparations causes their effects potentiation. Cinnarezine reinforces nootropic, hypotensive and blood vessel widening preparations operation. Antihistaminic effect of the preparation may cause false negative result at time of allergin sampling, so it is recommended to terminate preparation reception 4 hours prior to allergic sampling. Cinnarezine may cause false positive reaction in sportsmen at time of anti-doping test. Symptoms: sleepiness, muscle weakness, tremor, vomiting. Treatment: treatment is symptomatic, gastric lavage is necessary; there is prescribed activated charcoal or other adsorbent. Specific antidote doesn’t exist. Influence of vehicle and mechanisms management: Preparation may cause sleepiness. Patients whose activity needs attention concentration and quick psychomotor action should be careful. Package: 20 tablets on polyvinyl chloride blister, 2 blisters in the box. Order of issue: Pharmaceutical product group II - issued with a doctor's prescription.